After Hubble: Will Budget Woes Kill NASA's Next Great Telescope? Over the past hundred years or so, the science of astronomy has been utterly predictable, in an utterly unpredictable sort of way. Decade after decade, telescopes got steadily bigger and more powerful, and expanded their range beyond ordinary visible light into the hidden realms of ultraviolet, infrared, radio waves and more. And with every one of those leaps, astronomers discovered something unexpected and astonishing  massive black holes spewing blasts of energy into space, tiny neutron stars spinning a thousand times a second, dark matter pushing galaxies around like toys, and even the afterglow of the Big Bang at the dawn of time. It was fun while it lasted. Last week, a House subcommittee proposed to kill off funding for the James Webb Space Telescope. The new instrument  which would orbit the sun just a little farther out than the Earth  is the heir apparent to the Hubble Space Telescope, NASA's flagship space-science project. 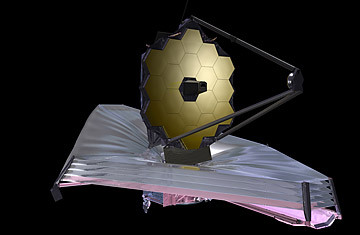 Some kind of second act was always seen as a good idea, but the folks on the Hill have a right to be exasperated with the way this one is turning out: the Webb, originally proposed in the mid-1990s under the name the Next Generation Space Telescope, was supposed to launch by 2007 and cost about $500 million. But it's gotten progressively more expensive, less powerful and further behind schedule. An independent review board reported last November that the poorly managed Webb (uninspiringly renamed after a former NASA administrator) could end up costing up to $6.8 billion and wouldn't launch until 2015 at the earliest. With the Republican-dominated House determined to slash spending everywhere it can, the Webb is a nice, juicy target. It's not as though astronomers were completely thrilled with the Webb either, whose voracious appetite for money has sucked in about 40% of the agency's budget for space science. The telescope is the gorilla in the living room whose very existence has forced NASA to postpone or cancel other important projects  among them, a telescope called the Terrestrial Planet Finder, which would have searched for signs of life on earthlike worlds. But that just makes the cancellation of the Webb seem worse. "It's a double whammy," says Natalie Batalha, a high-ranking member of the science team for the Kepler probe, the spectacularly successful planet-hunting mission that's been delivering discovery after discovery since its 2009 launch. "The whole community has sacrificed to fund [the James Webb Space Telescope]. Everyone was unhappy, but we all knew how valuable it would be. And now you have Congress talking about canceling it." What makes the Webb so valuable is, first of all, its huge light-gathering mirror  more than 21 ft. (6.4 m) across, compared with Hubble's 7.8 ft. (2.4 m). It's so big that the mirror can't go up as a single piece of glass. Instead, it's made of 18 smaller mirrors that will unfold in space to form a mosaic. Since fainter objects are also generally older and more distant, the Webb will be able to study galaxies, dust clouds, and cosmic processes at the earliest stages of the history of the universe. Better yet, unlike the Hubble telescope, the Webb is designed to see mostly in infrared light  the kind emitted not only by distant galaxies but also by planets. The telescope won't be able to take pictures of earthlike planets at distant stars  they're too faint and too close to their stars, even for the Webb  but it can pick out bigger planets and give astronomers a sense of what they're made of and how they formed. Beyond that, scientists have already made enormous progress on the project, not only on manufacturing the mirrors for the Webb but also in developing electronic cameras to take maximum advantage of those mirrors  the same sort of technology that lets the Hubble take such fantastic images and do such extraordinary science. After so much money has been sunk into the work, it would be insane, say scientists, to throw it all away. Certainly, Congress has swallowed a loss on such sunk costs before. Back in 1993, it pulled the plug on the Superconducting Super Collider (SSC), a mammoth particle accelerator that could have unraveled the mysteries of the subatomic realm. The reason: cost overruns, delays and a sense that solving such esoteric mysteries was an impractical extravagance. The SSC is now a vast, $2 billion doughnut-shaped tunnel beneath the ground in Waxahachie, Texas. Frugality wasn't a crazy justification then, and it's not entirely crazy now. You can argue that particle physics or astronomy have valuable spin-offs  jobs for the people who build telescopes and accelerators, for example, and technological innovations that can move into the private sector. But you can also argue that there's no need for the U.S. to spend on projects that might well be on parallel tracks elsewhere. The Large Hadron Collider over in Europe may not be as powerful as the SSC would have been, but it will still do science and the knowledge will be available to us just as if the work had been done in Texas. Europe builds space probes and huge ground-based telescopes; so does Japan. So maybe we don't have to. On the other hand, even the budget cutters in Congress would probably agree that it's a good thing for America to be the world's leader in science and technology. And they might even agree, if pressed, that plenty of things are worth doing simply because they enrich the human spirit. Back in 1969, the Cornell particle physicist Robert Wilson went before Congress to testify in favor of building an earlier generation of accelerator. How, a Senator asked him, would this project help improve the security of the country? "It has nothing to do directly with defending our country," answered Wilson, "except to make it worth defending." See a brief history of the Hubble Space Telescope.